Update: Since this story published, Triston Chandlee lost his battle with lymphoblastic lymphoma. Our thoughts and prayers go out to his family. After a two-year hiatus, a very important event is returning to Hendricks County: the 4th Annual Striking Out Cancer Ladies Softball Tournament. The tournament, which is hosted by the Sweet Melissa Foundation, will be held Saturday, Aug. 25 at the Brownsburg Girls Softball Diamonds. 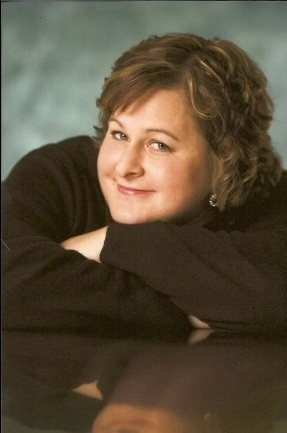 Established after the August 2006 breast cancer diagnosis for Brownsburg, Indiana, native Melissa A. (Sipe) Nichols, the Sweet Melissa Foundation is a not-for-profit organization that is run by the Sipe family and designed to support and positively impact other Hendricks County residents who are battling cancer. The Striking Out Cancer softball tournament generated between $12,000 and $16,000 per year in 2007, 2008 and 2009, before taking two years off due to the birth of triplets in the family. The tournament is back now, though, and 12 women&apos;s teams will battle throughout the day, with an exhibition game between two men&apos;s teams taking place during the awards ceremony. Backed by their corporate sponsor, Celebrity Cruises, the tournament also boasts a Kids Zone with attractions such as a petting zoo, face painting, pony rides, carnival games, and more. WFMS will be on-site, the bloodmobile will be conducting a blood drive, and there will be a raffle, silent auction, and vendors selling products to raise money. Why is this event held at the Brownsburg Girls Softball Diamonds? Sweet Melissa and her sisters basically grew up there, playing ball and being coached by their father, George Sipe. The Sipes were constantly at the diamonds, practicing, playing, and cheering on other teams. The good times, friends, and memories created by this experience are what motivated the family to develop this tournament to help those who are fighting cancer. This year&apos;s tournament benefactors are Triston Chandlee and Amanda Kelly. Triston is a 13-year-old student at Brownsburg West Middle School who has played football, basketball, and rugby, and is on the wrestling team. Outside of school, the active young man enjoys water skiing, wakeboarding, and tubing. What began as shoulder pain and developed into a severe cough and fatigue wound up being the side effects of a mass in Triston&apos;s shoulder and chest that was the size of a football. 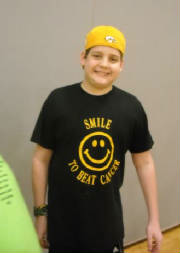 He was diagnosed with Stage 2 lymphoblastic lymphoma in February of this year. He&apos;s being treated at Riley Children&apos;s Hospital in Indianapolis and will undergo chemotherapy for the next three years. Amanda is a 32-year-old, stay-at-home mother of two girls, 8 and 4 years old. She&apos;s a 1998 graduate of Brownsburg High School and still lives in town, running her own business called Pastry Chef Amanda Cakes. While taking a shower in October of 2011, she noticed a lump in her left breast. Through the St. Vincent Breast Center, she was diagnosed in December with Stage 3 breast cancer that had metastasized to her lymph nodes. After six rounds of chemotherapy that made her sick and caused her to lose her hair, Amanda had a double mastectomy in April. She still faces radiation, more chemotherapy, and hormone therapy ahead, but her medical bills already top $100,000, and she&apos;s only about halfway through the treatment process. Amanda and her family do not have health insurance, and the staggering medical bills are the largest stressor in her family. Enter the Sweet Melissa Foundation and this softball tournament. Players, coaches, volunteers, and spectators are coming into the county from Florida, Virginia, Kentucky, Tennessee, Michigan, Ohio, North Carolina, and Maine for this Striking Out Cancer event. A team from Shelbyville, Indiana -- whose coach is a cancer survivor -- will also be participating for the second time. Visitors to Hendricks County will definitely want to check out TourHendricksCounty.com for information on hotels, restaurants, places to shop and things to do while in town. Interested in watching some softball and helping Triston and Amanda? Come up to the diamonds, located at 1001 S. Odell St., Brownsburg, on August 25. WFMS will be there from 9 a.m. to 10 p.m., and first pitch is at 10 a.m. The blood drive lasts from noon until 3 p.m., the Kids Zone will run from 11 a.m. to 3 p.m., and an after party is planned at The Dog House Sports Bar in Brownsburg later in the evening. 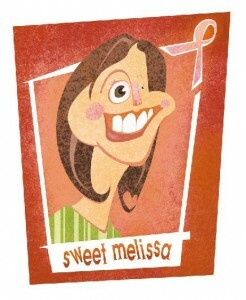 For more information about the Sweet Melissa Foundation and the Striking Out Cancer tournament, visit http://www.sweetmelissafoundation.org.